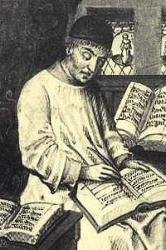 Thomas of Kempen, commonly known as Thomas à Kempis, was born at Kempen, about fifteen miles northwest of Düsseldorf, in 1379 or 1380. His family name was Hammerken. His father was a peasant, whilst his mother kept a dame's school for the younger children of Kempen. When about twelve years old he became an inmate of the poor-scholars' house which was connected with a "Brother-House" of the Brethren of the Common Life at Deventer, where he was known as Thomas from Kempen, and hence his well-known name. There he remained for six years, and then, in 1398, he was received into the Brotherhood. A year later he entered the new religious house at Mount St. Agnes, near Zwolle. After due preparation he took the vows in 1407, was priested in 1413, became Subprior in 1425, and died according to some authorities on July 26. and others on Aug. 8, 1471. 1. Vitam Jesu Christi. Imitation of Christ. Be the life of Christ thy Saviour. 2. Apprehende anna. Christian Armour. Take thy weapons, take thy shield. 3. Sustine dolores. Resignation. Bear thy sorrows with Laurentius. 4. 0 dulcissime Jesu. Jesus the most Dear. 0 [Child] Christ Jesu, closest, dearest. 5. 0 Vera summa Trinitas. Holy Trinity. Most true, most High, 0 Trinity. 6. Ad versa mundi tolera. Resignation. Bear the troubles of thy life. 7. 0 qualis quantaque laetitia. Eternal Life. 0 joy the purest, noblest. Of these translations Mr. Stone has repeated Nos. 5, 6, and 7 in his Hymns, 1886, and No. 4 in a rewritten form as "Jesus, to my heart most precious," in the same. Pastor O. A. Spitzen has recently published from a manuscript circa 1480, ten additional hymns by Thomas, in his “Nalezing op mijn Thomas à Kempis," Utrecht, 1881. Six of these had previously been printed anonymously by Mone. The best known are "Jerusalem gloriosa", and "Nec quisquam oculis vidit". We may add that Thomas's hymnwriting is not regarded as being of the highest standard, and that the modern use of his hymns in any form is very limited.